STOCK UP ON AIR is a group show featuring work from eight second year BA Painting students, taking place at Bow Arts’ Nunnery Gallery from 14 – 16 September. The exhibition explores the possibilities that a ‘painter’ can practice with different materials, mediums and subjects, inviting the visitors to navigate through a spectrum of work that boasts both what painting is and can be. 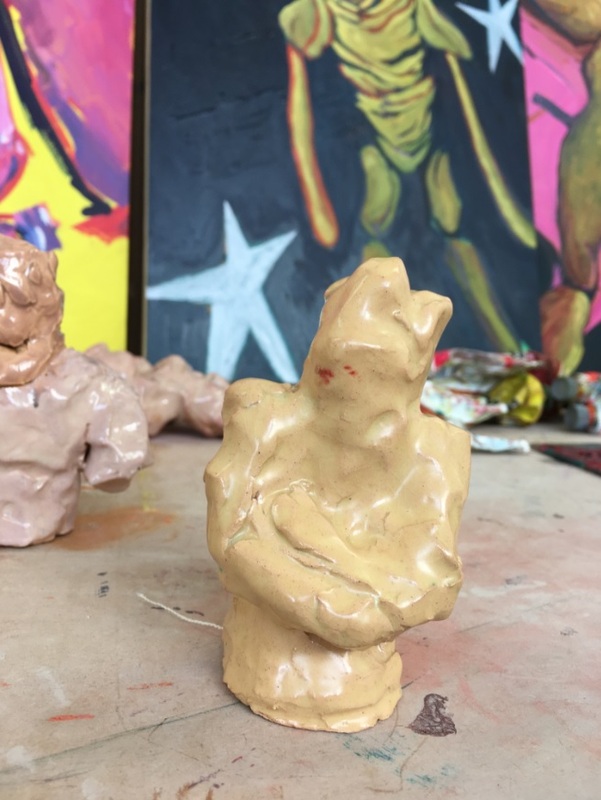 We spoke to Henry Glover and Hanne Peeraer, two of the artists who will be exhibiting, about how the exhibition came about, their painting practice and what they’ve enjoyed the most about studying at Wimbledon. How did the STOCK UP ON AIR exhibition come about? Henry: There was a group of us in our studio who all wanted to put on an exhibition. I started contacting galleries to see who would be happy to feature emerging artists or students, and that’s how we found the Nunnery Gallery at Bow Arts. We knew we wanted to make the exhibition about the fact that we were painters on a painting course, and the possibilities of what a painter can explore. Hanne: I immediately understood from the beginning that the thing that bound us all together as a group was the fact that we did things differently as painters. We all have specific ways of treating the painting course that is not always necessarily painting in the traditional sense. Tell us about the works you will be showing at the exhibition? Hanne: I’m very interested in human beings and philosophy. One of the foundational themes of my work is Plato’s theory of Forms, where he explains that everything that surrounds us has a concept underlying it. For instance, there are billions of beds in the world but there’s only one idea of a bed. It’s distinguishing between the underlying thing that you can’t see and touch because it’s an idea, and then its physical counterpart. For instance, recently I have started to use transparency in my work to paint my dad who died when I was young. This was the first notion I had of the mind being independent from the body, when people would say to me “he will always exist in your memory”. The paintings that I am showing at this exhibition respond to that same idea but in a more conceptual way. I’ve been taking pictures from tall buildings like the Tate Modern, where you can see people and their shadows. In their shadows, they become an abstract shape rather than clear representation of a human being, so my work is hinting at the idea of a human being without actually being a realistic representation of one. I paint very detailed faces to catch the eye, and in that way I try to make a connection between the work and the observer, because humans recognise themselves in other humans. Henry: The work I’m showing began with a project we were given where we had to make work based on places outside of our studio. I looked around the market in Tooting and I became obsessed with the weird hodgepodge looking dolls and mannequins I saw there. I found them to be interesting in that they resemble the human figure, but because they’re dolls I can manipulate them, dislocate them and do all sorts of different things to them. My work then became about how I could abstract the doll form with the notion that it’s human, giving it a weird uncanny ambiguity and making the viewer feel uneasy but also having them relate to it. I’m showing some ceramic forms, as well as cropped paintings of larger paintings. 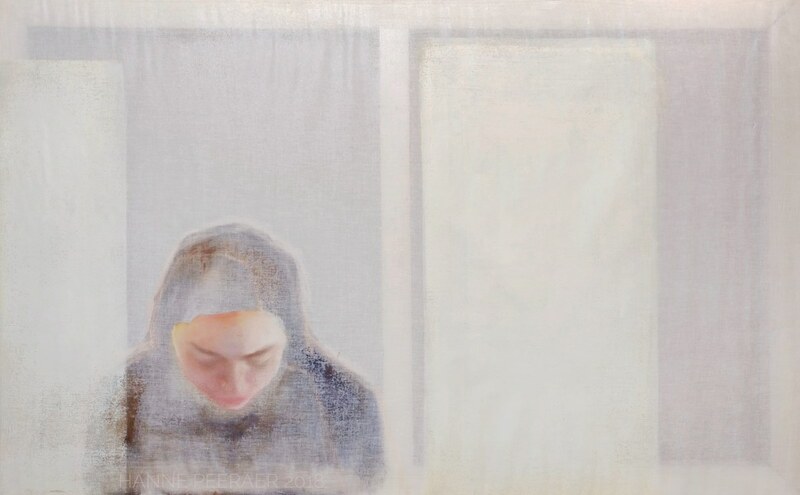 Hanne: I think what connects all of the works in the exhibition is this intangibility of the subject matter where you know what it is but you can’t really see it. I feel like all of the artists showing at the exhibition explore these similar themes in our work. What skills has organising an exhibition outside of college given you that you think will be useful in the future? Henry: I’ve learned the importance of being persistent, and also of making sure everyone has a say. We’ve been really even-handed in ensuring we all contribute and make decisions, whether it’s the name, the poster or choices to do with curation. I feel like we’ve been doing it right so far, but next time we organise an external show we’ll know even more because of this experience. Hanne: For many of us it’s the first real interaction we’ve had with a proper gallery, so that in itself is a learning experience. The main thing that surprised me about organising this was that we actually have a say in we want. My perception of organising a show, especially as a young artist, was that authority figures would dictate what you had to do, but we all have a sense of responsibility and ownership over the show. Henry: Rosamond (Murdoch), the gallery director, has been extremely helpful to all of us and has actually visited the college to see our work. I’ve had several meetings with her and all the artists have met her, and it feels much more real like that, rather than just endless emails. Can you both describe your current artistic practices? 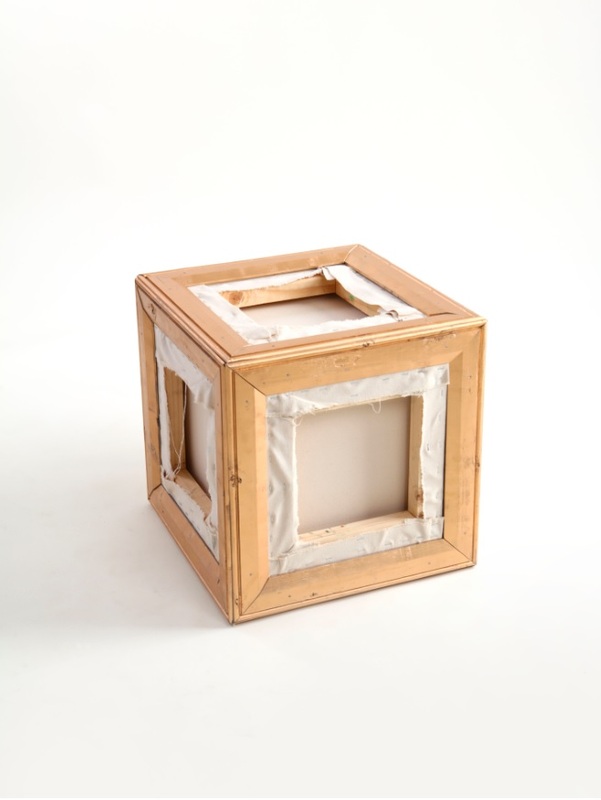 Henry: I don’t seem to have a primary material or medium that I use to make work, but I find things that require a process seem to give me a lot of inspiration. I create process-heavy paintings and sculptures of uneasy and tense representations of the human form. Hanne: My work is about the intangible presence I mentioned earlier, I don’t have another way of saying it that doesn’t make it sound so spiritual. We all have our own subjective realities that we live in, but we also have these collectively constructed realities, in our society, culture and even language that connect all of our minds. The transcendental reality that lies beyond what we can see, hear, smell, touch etc. is the part that I always try to represent in my practice. It’s very difficult because it means putting into physical form something that is not physical, so that’s the challenge for me. What have you enjoyed the most about the BA Painting course so far? Hanne: What amazed me is all the possibilities that you have. For example, I had this idea that I wanted to start using translucency and layers in my work, but I had no idea how to achieve it. I asked my tutor and he put me in touch with Tim, the painting technician, and he gave me a fountain of different ideas of how to do it. He also personally took me to the workshops and explained my goal to the other technicians, and all of a sudden this vague idea was a reality. On the same day that I asked the question, I had solutions for things I could use. The accessibility that we have to all the workshops is amazing and the tutors really support you in realising your ideas. Henry: The thing I’ve enjoyed the most are the tutorials and group crits. I struggle to explain what my work means a lot of the time, because it happens very organically and I often don’t think about why I’m doing what I do; only when it’s finished am I able to stand back and try to understand it. We have a lot of contact time here with tutors and frequent group crits and it’s been very useful to get people’s advice and interpretations of your work. Hanne: Music has always been a very important influence on my work. Often when I’m painting, the music I am listening to really influences the way the painting looks. Especially artists like Pink Floyd, their amazing noises engulf you and it creates such a good headspace. Henry: Everything I’ve been doing lately harks back to when I was really little and I was playing with clay and Play-Doh or plasticine to make stop motion animations. For a long time I thought I was going to make animations or be a film director. As an animator there’s a certain kind of very literal control over what’s going on, and I think that kind of mind set with animation and film has been a constant inspiration for what I’ve done on the course. What advice would you give to someone who is interested in studying painting? Henry: Don’t be so rooted in what you’re good at. Be open to experimenting, and listen to what the tutors have to say, even if you disagree. Once you’ve tried and tested something that you don’t like doing, you can learn from it even if it means you never do it again. Hanne: I would say don’t be so scared. I remember when I looked at the work of the current students, I thought I would never be as good, but the path is formed step by step and as long as you keep at it you will get there. Before I knew it I was actually happy with what I was doing. The course is designed to help you develop what you’re trying to achieve, so don’t worry if it doesn’t happen immediately. 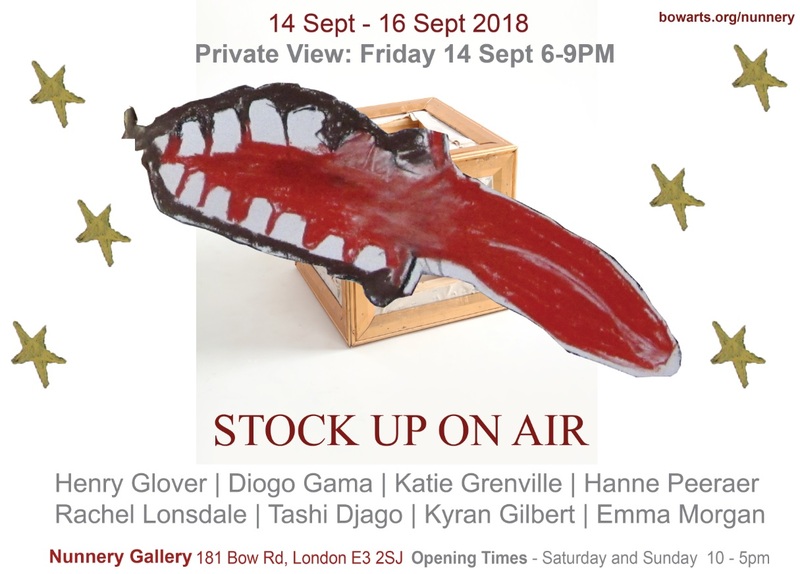 STOCK UP ON AIR is showing at the Nunnery Gallery at Bow Arts from 14-16 September (private view Friday 14 September, 6-9pm). For more information including opening times, visit the Bow Arts website. BA Painting at Wimbledon College of Arts still has places available for UK and EU applicants for 2018/19 entry. You can apply for this course via the ‘How to apply’ section on our website.